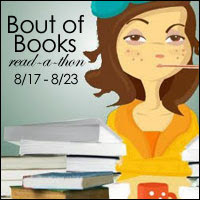 Raquel Gabrielle's Blog: Bout of Books 14! Yes!!! It is that time again for Bout of Books I am really excited this year for it and hope I can do as well if not better then I did last time. I will put up a TBR and goals up as it grows closer to the time but for now I encourage others to sign up and talk books with me! It should be exciting. I'm looking forward to the event. Best of luck to us both on meeting our goals. Happy page turning! Awesome I hope you do well! Good luck.